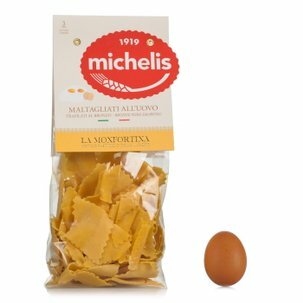 Only high quality durum wheat semolina and 25% fresh eggs, for an artisan pasta that lets you discover all the aromas of Langhe. These fettuccine are in fact made by La Monfortina in the heart of the Piedmontese hills, in Monforte d'Alba, following the traditional recipes that our grandmothers always made to delight our palates. 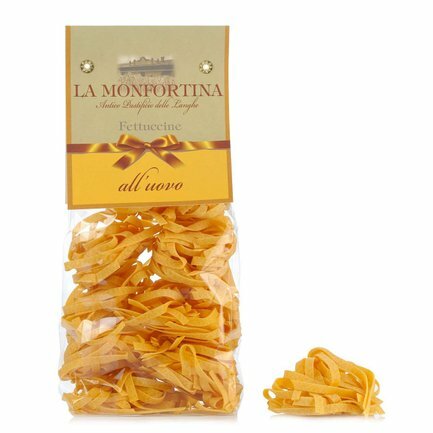 Ideal with a delicious artisan meat based sauce, these fettuccine can be served with the most adventurous ingredients so you can serve tradition that is updated with creativity. Ingredients INGREDIENTS: DURUM wheat semolina, fresh EGGS 24%. ALLERGENS: cereals containing gluten (wheat), eggs. For more information on product labels, please contact our Customer Service department. The information on the labels of the products may vary for reasons beyond our control, therefore, there may be discrepancies between the information on the site and that on the products delivered. Please always check the information on the product before consumption or use. 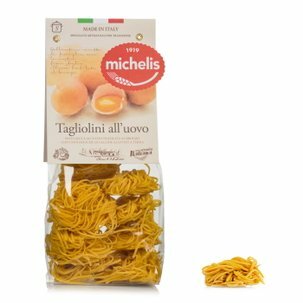 On the hills of Langhe, in Monforte d'Alba, La Monfortina prepares tajarin and pasta made with eggs according to the tradition of Langa. The pasta dough is made using only fresh eggs, it is then cut by hand and left to dry naturally for 24 hours.